Making pretty Easter Eggs doesn’t have to be mess– in fact, you don’t even need dye! Been there, dipped that. I get it, we all like pretty eggs….but come on. 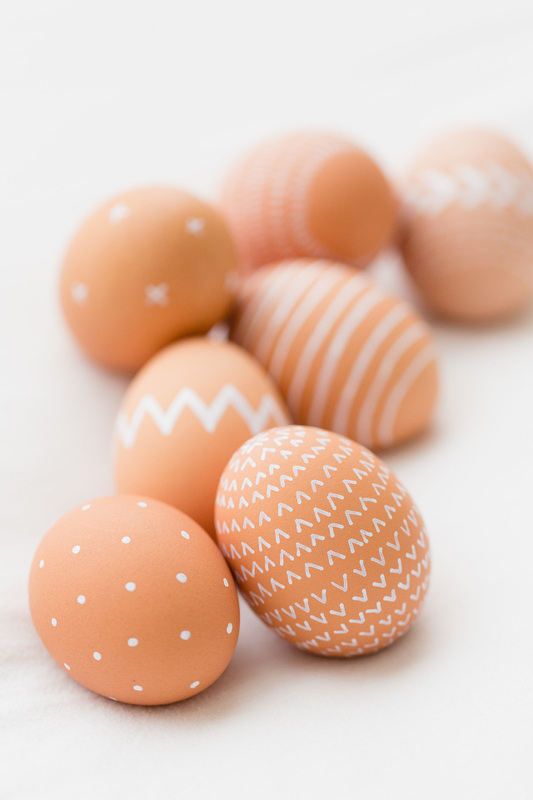 Before you go out and buy that cheap egg dying kit from the grocery store, take a look at some of these non-dye Easter Eggs ideas that are just- as- easy but will hopefully keep your fingers a little cleaner and, add a little twist to this Easter ritual with some of the following ideas we’ve collected from other creative minds. Plus you won’t have to try and balance an egg on one of those not-so-helpful metal egg holders that your kids think are great. Which one of these Non-Dye Easter Eggs are your favourite? I would love to hear your suggestions for other ways to decorate Easter Eggs in the comments below. Hope you have and Egg-cellent day! I really love those glitter eggs. 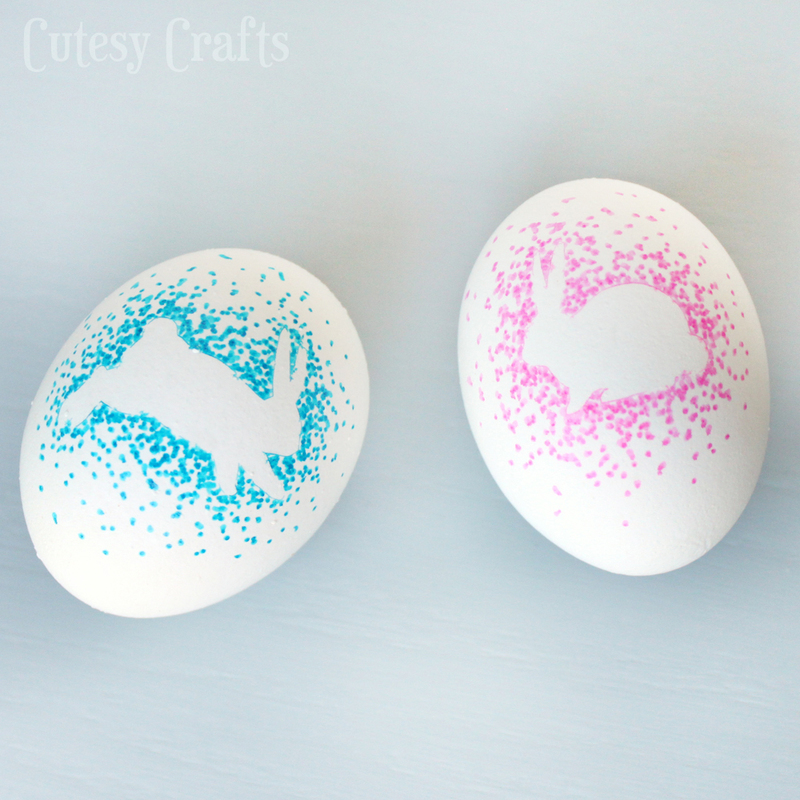 These are fantastic easter egg decorating ideas! What a great idea you have. So creative and cute! Glad you shared that. Thanks. I love all of these… These are great ideas to mix up egg decorating! Thanks! 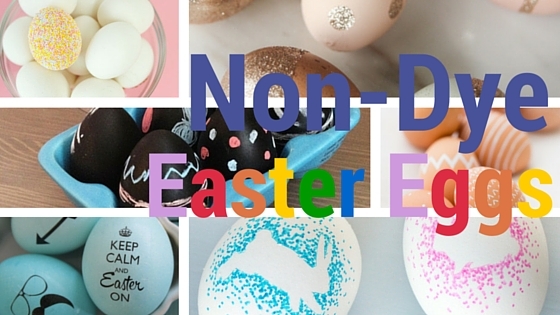 what a great list of non dye decorative art for Easter eggs… less mess is best! thanks! I love the chalkboard Easter eggs. They look easy to decorate and mess-free once the kids get them! I love all of these, I’m such a non-traditional so the various designs speak to me. I’m going to try a couple of these this year. Super cute ideas, and I love the non-dye idea as well! With all the chemicals out there, I like to have safe alternatives for my boys! Thank you! Great options. We will probably jsut do the normal colors but I love the glitter ones. My daughter would too! We too like to decorate our Easter eggs without using dye. Usually we use stickers and Sharpies. I’m loving those sprinkle eggs! What clever ideas! We are going to use Kool Aid that has been sitting in my cabinet forever to dye our eggs this week! These look amazing. All those years such a mess and the food coloring is not good for you! I have to try it! I love the sprinkle eggs! We literally were dyeing eggs last night, and my son’s hands were covered in dye which was still there even after a bath. I love them all but think the hipster ones are definitely my fave! However I think staining your fingers is definitely something we all remember from dyeing our easter eggs and makes it so much more fun. You shared a lot of cute egg decorating ideas for people who like to celebrate the Easter Bunny. Those are all really cute. 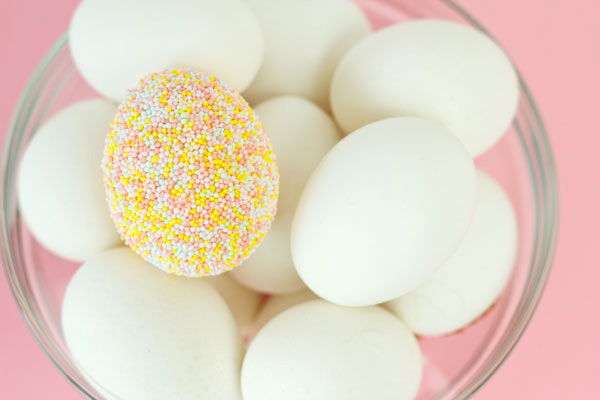 I would have never thought about putting sprinkles on an Easter egg! Wow, so many great ideas here. I love those hipster eggs! The chalk board eggs have my vote for favorite. My kids would really be into those. These are cute options. 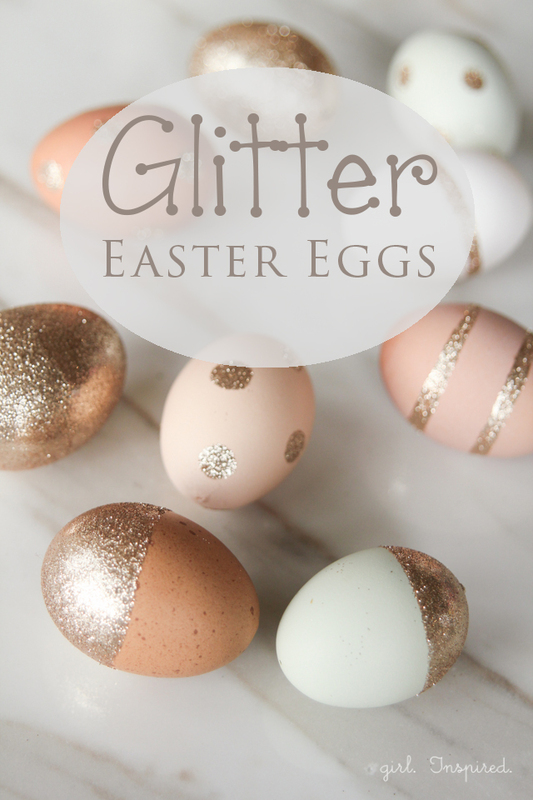 I will do egg dying with my kids just for the experience but I do love the glitter eggs option. These are great ideas to mix up egg decorating! They look very cool with sprinkles! These Easter eggs are so cute! I think I like them better than the traditional dyed Easter eggs. I wish these had been around when my daughter was young. The hipster eggs are hysterical! I think we might try the Sharpie ones! I like the glitter ones! I hate when my fingers are all dyed! These look amazing. All those years my fingers were stained. I have to try this. I love the sharpie idea! It would give you so much more control. Oh My what gorgeous eggs. I love coloring eggs for Easter so much fun. Then eating them after is even better. Those Chalk Board Eggs are so clever! I’ve actually never seen anything like that before. I might have to try that out this weekend when I’m decorating Easter eggs. I’m loving the sharpie egg idea. We’ve been doing vinegar-based dyes for so long. We need a change of pace! Those are really cute. I always look for new and fun ways for egg decorating. 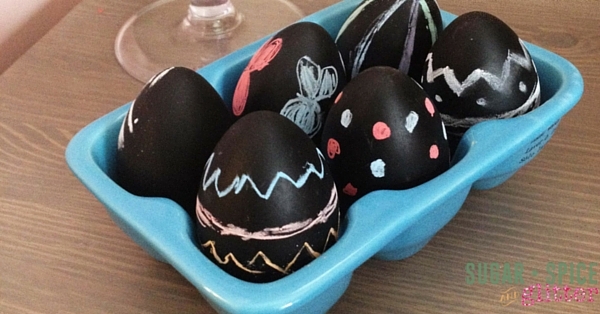 THese are great alternatives for decorating Easter Eggs. I like all these ideas you present, but I really love the glitter ones! Glitter makes everything better! I love the naturally brown eggs with the white designs. That’s a really cool, subtle way to decorate eggs for Easter! I love the idea of naturally dyed Easter Eggs. I remember all the years I’ve tried to scrub that dye off my fingers. Those Sharpie & Hipster Eggs are so cute! I remember winding up with colored fingers in my childhood. These are all very creative.